Das war mein Outfit gestern. Heute kommt hoffentlich heut Abend noch. War gestern wieder den ganzen Tag an der Uni, erst arbeiten, dann Sport und dann Chor - schöner Tag. That's yesterdays outfit - i hope today's will come later. I spent the whole day at the university yesterday, first working, than fitness and choir at the end of the day - great day! shirt: h&m - cardigan: primark - boyfriendjeans: h&m - wedges: primark - bag: primark - necklace: primark - rings: h&m etc. everything about this outfit deserves two thumbs up. 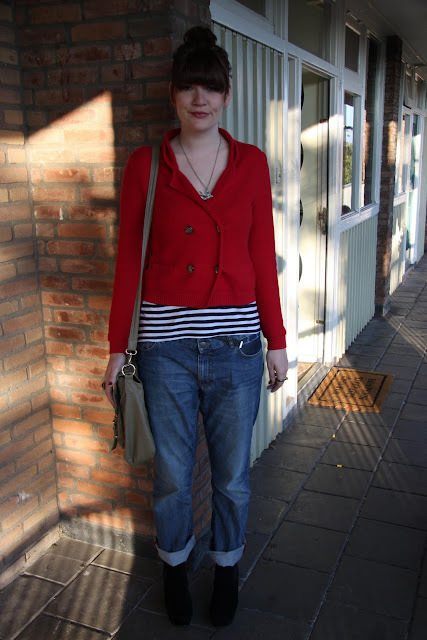 the jacket is awesome, the rolled up jeans are totally cool, the stripes add a bold touch, and the shoes are fantastic!